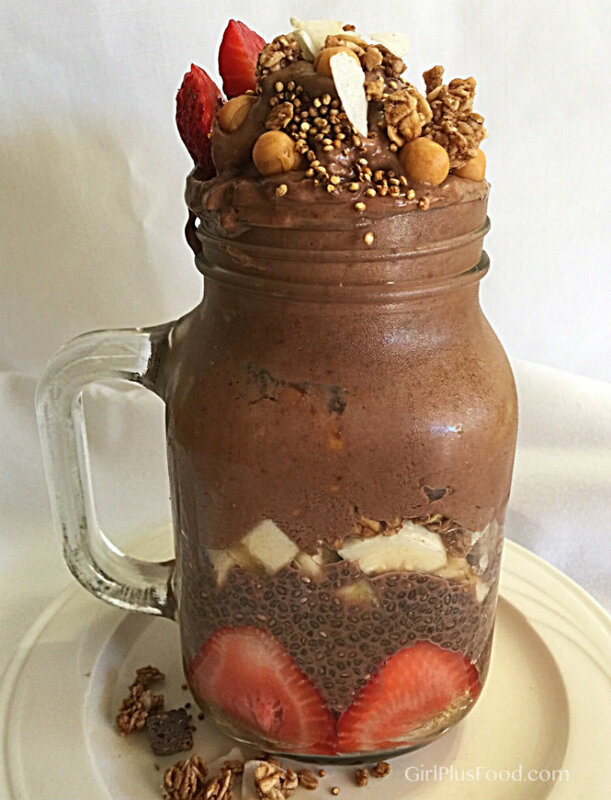 Chocolate nice cream, chocolate chia pudding, strawberries, bananas, puffed quinoa, granola, chopped almonds.Did the photo above make you gasp? Looks insanely decadent, doesn’t it? 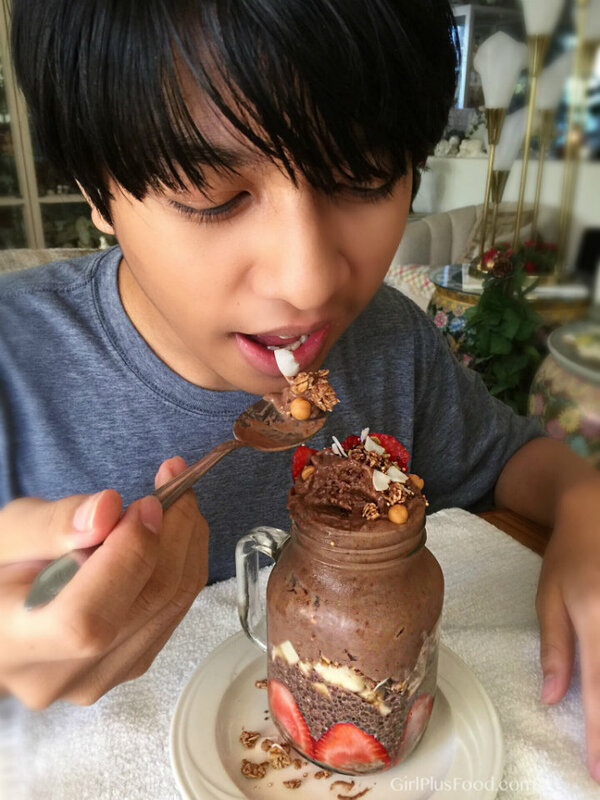 Would you believe me if I told you this most sinful #foodporn is made completely of fruit and nuts… and totally healthy? This, my dear friends, is nice cream. Ice cream made by blending frozen bananas in a blender until it’s smooth and creamy like soft serve ice cream! Blend in your favorite fruit, nut milk, nut butter, or cocoa nibs and holy moly, you’ve created a little piece of heaven in your very own kitchen. Peel and cut over-ripe bananas into large pieces and freeze in an airtight container. 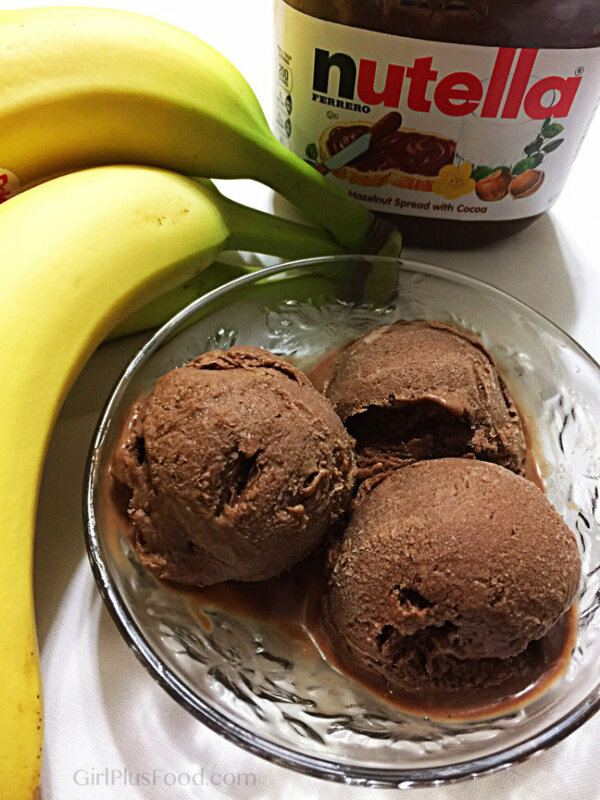 Once frozen, place bananas into blender with 1/4 cup milk of choice and blend until you achieve a soft-serve texture. Serve immediately or store in container and freeze another 30 minutes. Scoop out and serve like ice cream! 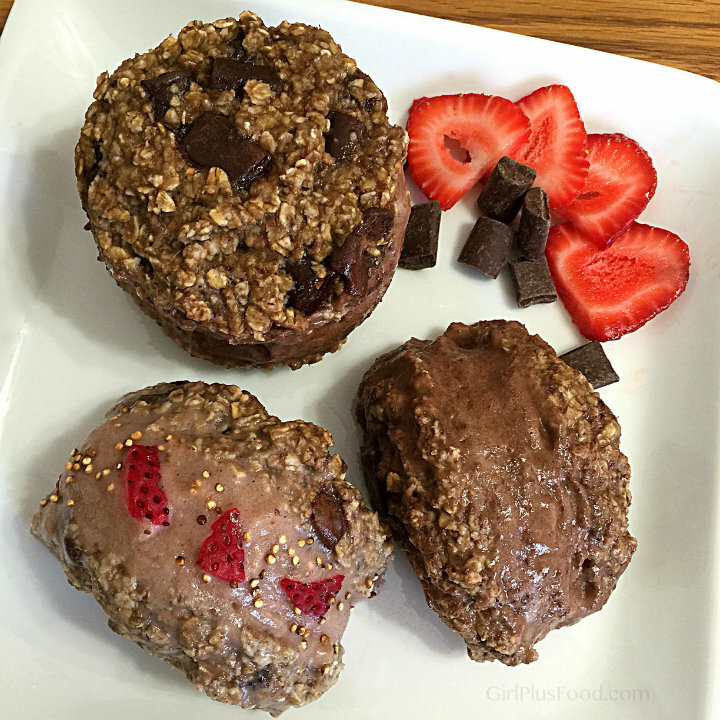 Chocolate: Add 1/4 tsp vanilla extract and 3 tbsp cocoa powder to frozen bananas & chocolate almond milk, then blend. For peanut butter cup nice cream, add 2 tbsp peanut butter. Nutella: Add 4 tbsp Nutella. Nutella nice cream. ‘Nuff said.Peanut Butter: Add 4 tbsp peanut butter (try almond butter too… Ohhhmaaagaaahhh so good!). Cookies & Cream: After blending frozen bananas & milk, add crushed cookie sandwich to mixture (I used oreos). Transfer to container and freeze for 30 minutes before serving. Strawberry: Add 1 cup frozen strawberries. 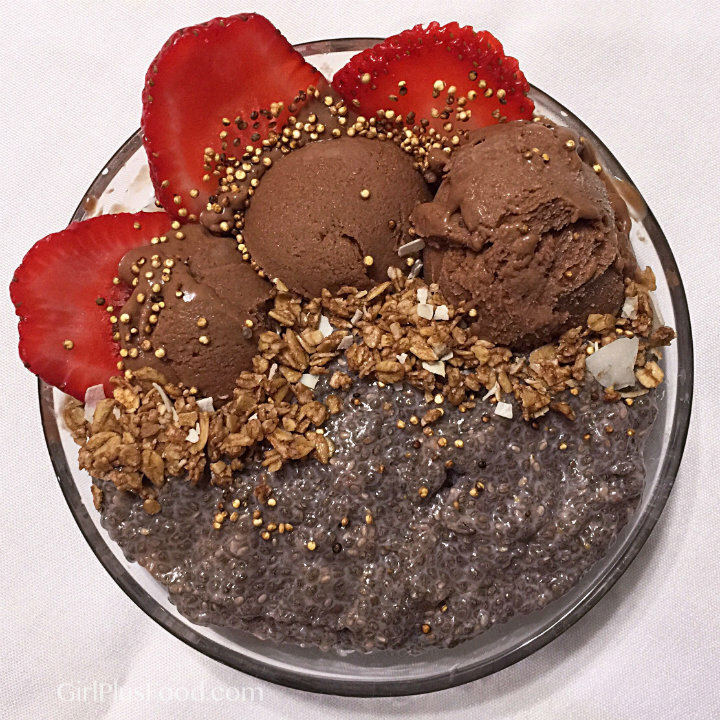 Strawberry nice cream, strawberry chia pudding, strawberries, bananas, powdered cocoa nibs.Coffee: Add 1/2 tsp instant coffee. Vanilla: Add 1/2 tsp vanilla bean paste. 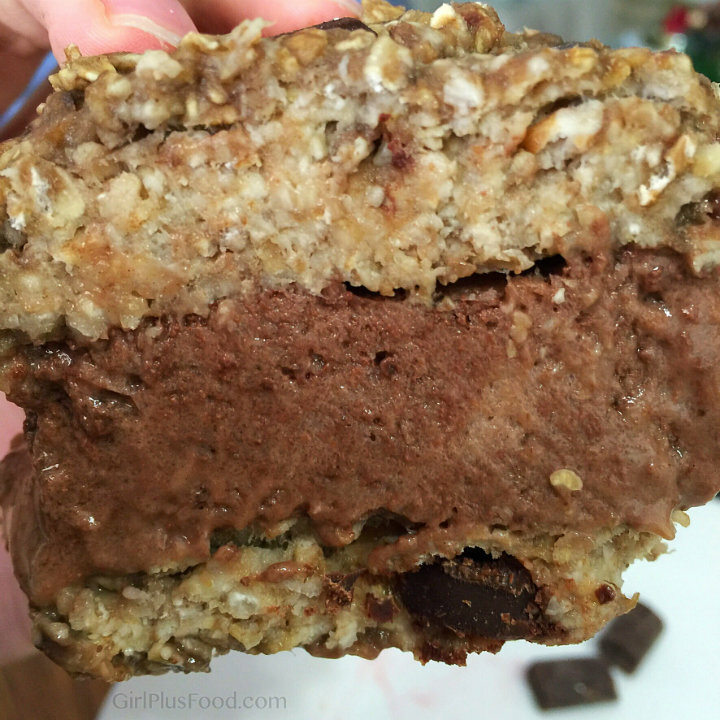 Nice Cream Sandwich: Spoon nice cream flavor of your choice between two Banana Oatmeal Cookies! HO—-LY DELICIOUSNESS! Strawberry and chocolate nice cream sandwiches. Look how thick these babies are… This is serious.Dessert for breakfast? Heck yeah!!! They look delicious Carmen! I’ve been wanting to try this for some time now – I think today is the day! Thank you for the simple recipes and your beautiful photos!